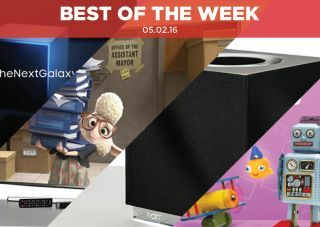 Best of the Week: LG and Samsung MWC teasers, Naim Mu-so Qb, Humax Freeview Play and more | What Hi-Fi? This week both LG and Samsung teased details of their Mobile World Conference presentations, and YouTube Red and Tidal revealed plans for entering into production of original content. Reviews-wise we had three five-star reviews with Naim's Mu-so Qb wireless speaker, Humax's FVP-4000T set-top box and Samsung's UE65JS9000 4K TV taking top honours. The Mobile World Conference (MWC) is almost upon us and Samsung has released a teaser video for its annual Unpacked event, where we'll get our first look at the Galaxy S7. It takes place a day before MWC and should offer an indication of Samsung's smartphone line up and the company's Virtual Reality plans too. Rumours persist that the S7 will remain the same as the S6, but could reintroduce a microSD slot as well as Samsung's take on a pressure-sensitive screen similar to Apple's 3D Touch. Not content with being the date for Samsung's Galaxy S7 reveal, 21st February will also be the date for LG's G5 event. All we know is that we have received an invitation to 'LG G5 Day', with the line "come meet new friends" suggesting there could be more than one announcement. Little else known about the successor to the G4, a phone we liked a lot. What Hi-Fi? will be live at MWC to report on all the latest news and products to come out of the event. Following Spotify's announcement that it will roll out video content in the US comes news that both YouTube and Tidal are preparing their own original content. YouTube's offerings will be available from 10th February and include three feature-length films, one of which features YouTube superstar PewDiePie. Tidal has ordered two series – a comedy and drama – including the second season of New York drama Money & Violence. That will be available from 9th February. YouTube Red is currently restricted to the USA, but a recent deal could see it reach the UK later this year. "It’s a masterclass in timing, and it’s this that really makes the Qb character one to fall in love with." The original Mu-so is a lovely piece of hi-fi and with its latest speaker, the Qb, Naim has taken what made the Mu-so great, and squeezed it into a smaller form with few compromises. It's a stylish speaker and one that packs plenty of features to go with a big, bold sound that's bigger than you'd expect. However, it's not quite perfect. The bass is a little rich and the midrange could use more insight. Nevertheless, Naim has delivered an impressive speaker in the Qb. "It looks good, physically and on screen, and is a fine route to catching everything you want to see on Freeview HD." A year ago Humax announced it would be the first to produce Freeview Play set-top boxes. The Humax FVP-4000T has arrived and it's worth the wait. It's a stylish box that makes watching content simple and with its straightforward set-up and operation, plus plenty of connectivity options, it's easy enough to use. Freeview Play is smooth and both picture and sound are rock steady. A shortage of apps such as Netflix (an update is coming) takes a little of the gloss away, but even so, the FVP-4000T is a streamlined catch-up box. "It is an excellent TV from the top of a series that has done extremely well." Another week, another Samsung television and another five-star rating. There's little the Korean manufacturer can do wrong with its TVs. The 4K picture is excellent, with spades of detail and clarity. Sound is better than expected, with its smart offerings useful and well integrated. 3D glasses are sold separately so you'll have to fork out for them if that's of importance. Otherwise there's a lot to love and little to hate.